The 40G QSFP+ transceiver module is a hot-swappable, parallel fiber-optical module which has four independent optical transmit and receive channels. These channels can terminate in another 40G QSFP+ transceiver and can also be divided out to four separate 10G SFP+ transceivers. The QSFP+ transceiver module can operate on both copper and optical fiber cables. For example, QSFP-40G-SR4 module supports link lengths of 100m on OM3 multimode optical fiber and 150m on OM4 multimode optical fiber. Now, this 40G QSFP+ transceiver is mainly used in short reach applications in switches, routers, and data center equipment. As it provides higher density than 10G SFP+ transceivers, people are more likely to use this effective transceiver in these few years. But do you really know how to install a 40G QSFP+ transceiver? This article may offer you some specific guidances. Step 1: Attach an ESD wrist strap to yourself and a properly grounded point on the chassis or the rack. Step 2: Remove the QSFP+ transceiver module from its protective packaging. Step 3: Check the label on the QSFP+ transceiver module body to verify that you have the correct model for your network. Step 4: For optical QSFP+ transceivers, remove the optical bore dust plug and set it aside. b. Align the QSFP+ transceiver in front of the module’s transceiver socket opening and carefully slide the QSFP+ transceiver into the socket until the transceiver makes contact with the socket electrical connector. Step 8: For optical QSFP+ modules, reinstall the dust plug into the QSFP+ transceivers optical bore until you are ready to attach the network interface cable. Do not remove the dust plug until you are ready to attach the network interface cable. After reading this text, I hope you can get a clear understanding of how to install a 40G QSFP+ transceiver. If you want to know more about this 40G transceiver, you can visit Fiberstore which provides many tutorials about all kinds of fiber optic transceivers. And if you want to buy QSFP+ transceiver, I also recommend you to visit Fiberstore. 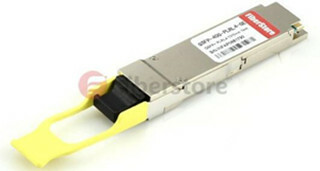 The fiber optic transceivers they offered are always at low price and high quality. This entry was posted in QSFP+ Transceiver and tagged 10G SFP+ transceivers, 40G QSFP+ transceiver, 40G transceiver, fiber optic transceivers, QSFP Transceiver, QSFP-40G-SR4, QSFP+ transceiver module on July 29, 2015 by Alice.Gui. Monday again, welcome to my blog. This week, we are going to finish the topic “A Complete Guide of Installing or Removing Transceiver Modules”. As we know, we continue this topic for almost three weeks, and today, we will explain the Part III, ie. the last part. The Part III is explaining mainly the installation and remove of QSFP/QSFP+ and CFP. After learning the Part I and Part II, you may have a better understanding of installing or removing transceiver modules, such as SFP, X2, GBIC, XENPAK or XFP etc. You may also find that the different transceivers are similar in the installing or removing steps. Nonetheless, there is unique feature of different transceiver modules which affect the installing and removing, so that we should be carefully and understand each type of transceiver. OK, now we are return to today’s main topic – How to Install or Remove the QSFP/QSFP+ and CFP. step 7: Press firmly on the front of the QSFP+ transceiver with your thumb to fully seat the transceiver in the module’s transceiver socket. 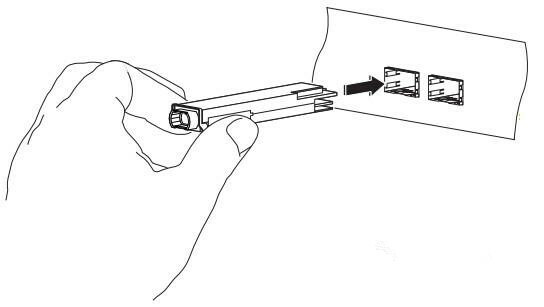 Please Note: If the latch is not fully engaged, you might accidentally disconnect the QSFP+ transceiver module. step 8: For optical QSFP+ modules, reinstall the dust plug into the QSFP+ transceivers optical bore until you are ready to attach the network interface cable. Please Note: Do not remove the dust plug until you are ready to attach the network interface cable. step 1: For optical QSFP+ transceivers, disconnect the network interface cable from the QSFP+ transceiver connector. step 2: For QSFP+ transceivers equipped with a bail-clasp latch. a. Pivot the bail-clasp down to the horizontal position. b. Immediately install the dust plug into the transceivers optical bore. c. Grasp the sides of the QSFP+ transceiver and slide it out of the module socket. a. Immediately install the dust plug into the transceiver’s optical bore. 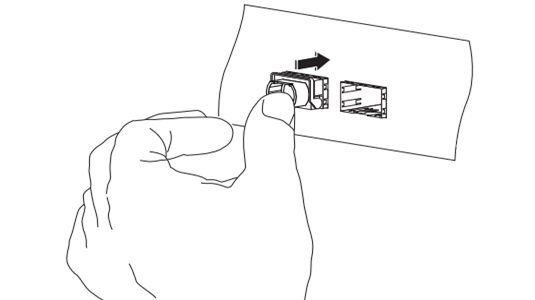 b. Grasp the tab and gently pull to release the transceiver from the socket. c. Slide the transceiver out of the socket. step 4: Place the QSFP+ transceiver into an antistatic bag. step 1: Remove the CFP transceiver from its protective packaging. step 2: Check the label on the CFP transceiver body to verify that you have the correct model for your network. step 3: Remove the dust plug from the CFP transceiver module optical port and set it aside. step 4: Align the CFP device into the transceiver port socket of your networking module, and slide it in until the CFP transceiver EMI gasket flange makes contact with the module faceplate. step 5: Press firmly on the front of the CFP transceiver with your thumb to fully seat it in the transceiver socket. step 6: Gently tighten the two captive installation screws on the transceiver to secure the CFP transceiver in the socket. step 7: Reinstall the dust plug into the CFP transceiver’s optical bore until you are ready to attach the network interface cable. step 8: When you are ready to attach the network cable interface, remove the dust plugs and inspect and clean fiber connector end faces, and then immediately attach the network interface cable connectors into the CFP transceiver optical bores. step 1: Disconnect the network fiber-optic cable from the CFP transceiver connectors. Immediately reinstall the dust plugs in the CFP transceiver optical bores. step 2: Loosen the two captive installation screws that secure the CFP to the networking module. step 3: Slide the CFP transceiver out of the module socket. Immediately place the CFP transceiver in antistatic protective packaging. Up to here, the topic “A Complete Guide of Installing or Removing Transceiver Modules” has already finished. Thanks all the reader for continued focusing. In fact, the installing or removing steps of the mentioned transceiver modules are the general case. Different transceiver modules of different brands have their own features. We should ask the vendor to get more informations when you face a problem that we do not mentioned here. In addition, to save more money, we suggest that compatible 3rd transceiver modules may be another good choice but you should ensure that your vendor is reliable. Fiberstore‘s fiber optic transceivers are 100% compatible with major brands like Cisco, HP, Juniper, Nortel, Force10, D-link, 3Com. They are backed by a lifetime warranty so that you can buy with confidence. Additionally, customize optical transceivers to fit your specific requirements are available. If you have any requirement of transceivers, Fiberstore will be a good choice for you. This entry was posted in Transceivers Common Sense and tagged CFP module, CFP Transceiver, Cisco, fiber optic transceiver module, QSFP Transceiver, QSFP/QSFP+ on February 10, 2015 by Amelia.Liu.